I am the first to admit that I’m super organised. I like lists and I like to be prepared, so a survival kit was something that I started to get serious about a few years back. I never in my wildest dreams thought I’d actually need to use it. Like many, I thought “it won’t happen to us”. But then it did and we used it. We were lucky, we didn’t really need to use it to survive, but to have a major natural disaster and have comfort in the fact we could easily survive the recommended 3 days was great! Meanwhile, people who weren’t prepared stripped the supermarkets of … well pretty much everything. I can only assume that there are a large percentage of people who have absolutely nothing to eat in their homes to last more than a few hours. There are pre-made kits you can buy, but they can be an expensive outlay if you are on a budget or low income. We decided to stock our kit ourselves, so we made a list or food items and each time I got the groceries, I would purchase an item or two to go into the kit. Some non-food items we already had in the house, so we popped them into the kit straight away. Over the course of a few months, this became a respectable stash of items. 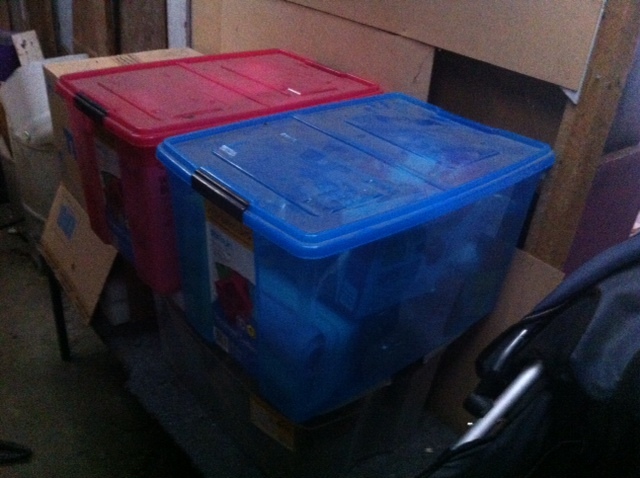 We bought a couple of large plastic tubs with lids to store our items. We then found a location to store them where we could easily get to them in the event of a disaster. We put them up off the floor so in the event of water getting in, they won’t get wet. These tubs are also portable, we could pack them quickly in the car and leave with them. Depending on your location and household members, your disaster kit contents and size will need to vary to suit your needs. What works for some people may not work for you, so you have to decide what is best for your own individual situation. For us, our biggest risk is earthquake so in the event our house was uninhabitable, we could still get to our kit as we keep it in our shed. Many kits also have items to heat food, we decided that we’d be happy with eating cold canned food for a few days. We did throw in matches though, we could make a fire and heat water if we got really keen. a massive separate tub of water – its huge! Every 3-4 months I review the spreadsheet and swap out the older food items or near expiry items, with newly purchased ones. Then we use what has come out of the survival kit to stock the pantry. When we had our earthquake(s), our home was still inhabitable and we didn’t lose power for too many hours at a time. We were able to also boil water easily on our gas stove (required due to possible ground water contamination) but for many, a survival kit would have made the disaster much easier to cope with. It took considerably longer than 3 days to get food and water to some neighbourhoods. In hindsight, I’d recommend at least 7 days worth. Also put in items that you like and will eat, if you don’t like the item, what is the point of having it in there? Some people say items like chocolate are good too, I’d agree, but our kits get too hot in the summer so it would melt. I’d also recommend reviewing the kit at different times of year, we didn’t consider hats and sunscreen until reviewing the kit one hot summer day. Likewise the winter weight sleeping bags – a cold winter day made us consider trying to keep warm outdoors. Practically speaking if a disaster does occur, you will need to have plans ahead of time on where you will meet family. What happens if you can’t get there? What happens if you are at work when disaster strikes? How will you get home if public transport is out and you can’t get to your car? These are all things you need to think about. In a major event sometimes power is out, streets are impassible and phones do not work. Planning is the key to riding out these events, hopefully your kit isn’t ever needed to keep you alive, but if it is, you may well be really glad of some forward planning. Obviously you need to work out what your family will require, but I urge you to consider you have a well stocked survival kit and I hope you never have to use it. Totally! After next pay day I am totally going to stock up a survival kit! These look great! Thanks for sharing how you made them. Thank you! Its a constant work in progress and I’m aiming to increase the amount of food we have stored. Some sites say 2 weeks if due to a pandemic but I’m pretty sure we’d have that much in our pantry if that was the case. This couple made their own 72 hour kits (survival or emergency kits). They used a very sensible approach and used everyday items. Please read how they did it and consider what you can do to prepare for the unexpected earthquake, snowstorm, etc. Awesome! I hope you never need to use it! 🙂 Thanks for reading. I just turned to my husband and said we need to do this. Thanks for the great tips. Disasters can happen at any time.